Tomorrow is Yom Kippur, so I will off-line for at least 24 hours beginning late this afternoon. I had intended to schedule my Wednesday post, but inadvertently published it. I was berating myself and then remembered the message of the High Holidays and of the coming the Day of Atonement. I realized in the scheme of life, sending it early was no sin and just as good as scheduling it to post automatically. Probably better. 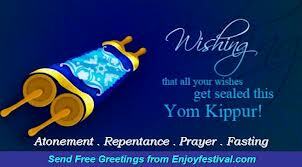 Yom Kippur is the day all observant Jews and many who observe only on Yom Kippur seek God’s forgiveness. We pray for God’s forgiveness. The service consists of many confessional prayers because when other Jews sin, the Jewish Community has failed. Yom Kippur atones only for sins between man and G-d, not for sins against another person. To atone for sins against another person, you must first seek reconciliation with that person, righting the wrongs you committed against them if possible. So on these last few hours, I ask if any of you have been offended by my posts, forgive me. I have done the best I could, and will continue to do so. Thank you for all you have given me and may you and the world continue to be offered the opportunity to survive and to bring peace between and for all. Stay strong, be kind, forgive, be grateful, do all you can to bring peace to your heart, your family, the world. This entry was posted in Take a Break Time and tagged dpchallenge, forgiveness, Katherine Gordy Levine, postaday, postaday11, Thinking about what matters, Yom Kippur. Bookmark the permalink.